“As a dental professional I am very particular about the dental work I do and I tend to focus on defects or abnormalities in a person’s smile. For many years I was unhappy with my own smile because I had teeth extracted as a teenager so that I could get braces to straighten my teeth. My smile has never been as broad and brilliant as I would like. I met Dr. Harnois at a continuing education course he was teaching in charlotte, NC. 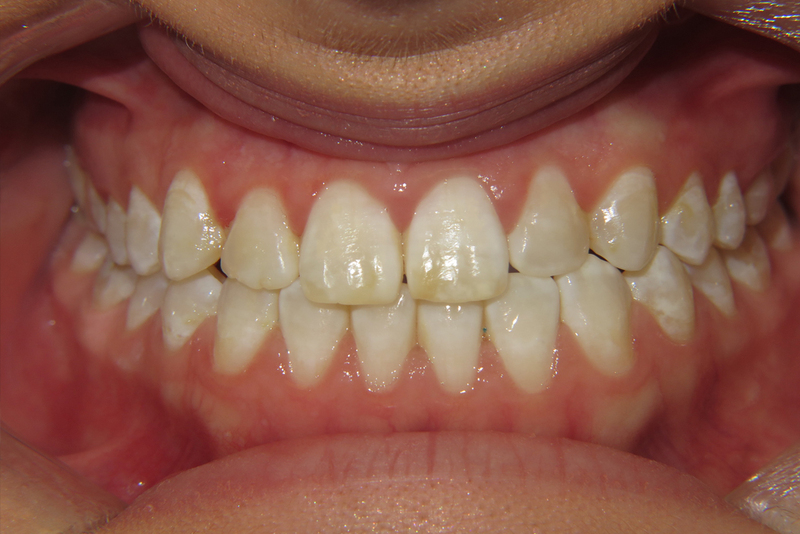 As he presented the numerous cases of cosmetic veneers that he has completed, I began to think about what might could be done for my own smile. We discussed my particular case and a plan for me to travel to Chicago. Dr. Harnois is so in tune with the minute details of his patients’ smiles that I felt I would never find anyone who cares more than he does. As a dentist myself, I feel like my expectations were set fairly high, but the result exceeded anything I had imagined! The changes are so natural and subtle that my coworkers are amazed at how it turned out. “Here’s what I love about Dr. Harnois and Hinsdale Dentistry. First, everybody is beyond friendly. They make you feel as though they’ve known you for a long time. Everybody from the receptionist (Jessica), to Dr. Harnois’ assistant (Sharon), went out of their way to make sure that I was comfortable, informed, and happy, and I really appreciated that. Additionally, their office is very modern and inviting! Another aspect I love is that Dr. Harnois does a phenomenal job explaining everything he is going to do and why. You can tell that he truly cares about his patients. He’s the type of person that you feel like you can trust, someone who is going to make sure that the work he does is top notch and flawless. More importantly, he ensures that you are happy with the work he’s done. He’s a perfectionist, which is a great quality to have in a dentist who specializes in cosmetic work. Ultimately, I made the decision to have a product called Lumineers placed and while it’s only been two short weeks, I am so happy I took this route. My smile looks natural, but more importantly, it FEELS natural. My teeth don’t look bulky, my bite feels no different than prior to having Lumineers placed, and I am getting compliments left and right on how amazing my smile looks. Dr. Harnois took such care, making sure my smile was just right and I really appreciated that. I took a chance and it worked out wonderfully! My wife had been encouraging me for years to improve my looks by having my teeth capped. Never bothered me, but it bothered her. I didn’t like the thought of having my teeth ground down, as was done to her. So I saw an ad in a magazine (I never respond to ads for personal services), but you and your smile looked so assuring, I called to make an exploratory appointment. Of course, in the interim I did learn one of my contacts was your patient, and very satisfied with her veneers. You were so professional, and quite charming and reassuring, that I asked you to proceed. I feel great – and my wife says I look great too. Thank you for providing me with such a major life change (makes me feel 15 years younger), at quite modest a cost! It doesn’t look like I have veneers or anything else, my Lumineers aren’t big and bulky, they’re just absolutely fantastic. There isn’t a day that goes by, that someone somewhere doesn’t compliment me on my smile. Your smile is like your hair, if it’s beautiful than you are. You doing my smile over, has made me the happiest person ever, I am constantly smiling all the time; because, I now have beautiful teeth. I can be more successful, with my new smile; my new smile just gave me a more complete look. And to think it only took an hour and a half, wow. Had I gotten braces and worn them for two years, my smile still wouldn’t be this beautiful. Your staff is absolutely wonderful; your office is extremely comfortable; being able to watch television during the procedure just really made me more at ease. And before I knew it, you were finished. I love my teeth now! The 6 month smile was amazing. I got them put in in January and removed them in August. The staff and dentist are great. I’m so glad I went there! My year-long journey with Invisalign has been a breeze. I finally have a smile I want to show off! I was always well-informed of every process before, during and after treatment. Never once did I leave the office with remaining questions. Appointments were painless even with my sensitive teeth! The office is modern, clean and technologically advanced. I always felt as if the staff had my best interest in mind. I highly recommend Dr. Kowalczyk and the team at Hinsdale Dentistry.